While continuing to run on a platform of green ambition, Hales failed to get the endorsements of the Sierra Club, the Oregon League of Conservation Voters, or Bike Walk Vote. Jefferson Smith took all three, in what was termed the ‘Green Sweep’. Shortly after, the Hales campaign was called out for raking in thousands of dollars in donations from corporations hoping to profit from coal exports. Despite the urging of critics, Hales did not return the dirty coal money. This obviously wan’t the last flip-flop of our new mayor. During the campaign, Hales favored expanding the successful SummerWorks and Summer Youth Connect programs for at-risk teens. Now, in a move that has shocked just about everyone, especially his supporters, Charlie Hales plans to cut $400,000.00 from these programs in embarrassing contradiction with what his own campaign website still claims. Austerity, thy will be done. And those transit passes for kids to get to school that former mayor Sam Adams fought TriMet over so vehemently to win back? Charlie Hales said he wanted to keep them during his campaign. Now he says he’s killing those, too. Sorry, kids, 2013 just ain’t your year. 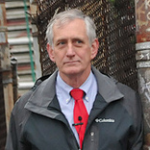 That’s right, Charlie Hales is going to lobby in favor of the Columbia River Crossing. Charlie’s now in support of those 17 lanes of asphalt that will pave over Hayden Island’s homes and businesses, destroying over 900 jobs in the process, despite the fact he promised he would not do so, and despite the fact that the CRC isn’t even in the city’s official agenda. All of the increased traffic, pollution, and greenhouse gasses that the CRC will create? Charlie’s got a plan to make it all happen. Apparently Hales thinks Portland can’t afford programs of social uplift for our children, but can somehow afford to spend taxpayer money to lobby for a freeway nobody wants. Hales’ die-hard supporters will likely try to spin this as a good thing, they’ll regurgitate the usual cliches about ‘increased vehicle mobility’ and ‘economic growth’, but deep down they know better. They know Charlie conned them into believing he was their progressive, friendly uncle. Now they have to face the fact that Charlie Hales is little more than a shrewd businessman with plans to make big money for his developer friends at the expense of our city’s future. Turns out hope wasn’t enough. If only someone had seen this coming.